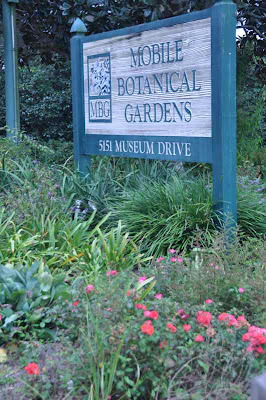 Saturday, Sept. 29, I attended my first program at the Mobile Botanical Gardens. 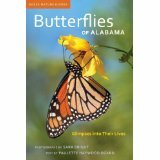 Featured were authors of Butterflies of Alabama: Glimpses into Their Lives. 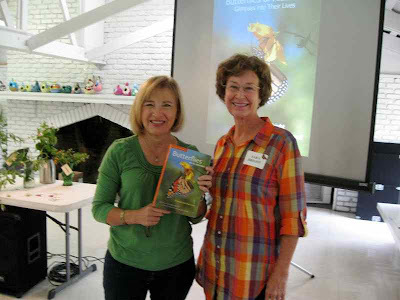 Photographer Sara Bright and writer Paulette Haywood Ogard spiced their overview of the state’s butterflies with humor and personal experiences from their 16-year pursuit of knowledge and images about butterflies. 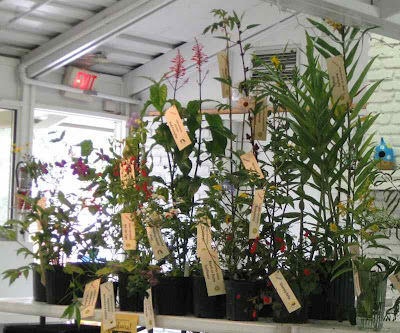 With an enthusiastic crowd milling around to examine exhibits and purchase books and plants before and after the program, I stayed seated and indulged in a little photo therapy. My indoor snapshots were of the “from where I sit” variety. On display was a sampling of living plants favored by butterflies, some for nectar and others as hosts for caterpillars. Can you find the human butterfly volunteer sporting wings and helping to usher youngsters to adventures of butterfly art and discovery? 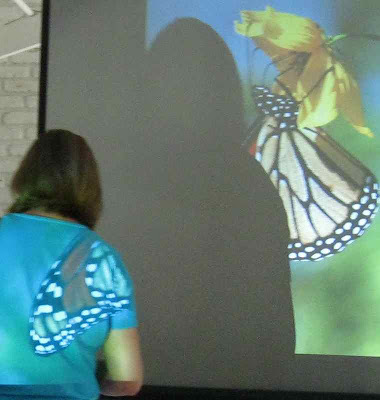 As I waited for a “butterfly walk” to begin after the presentation, individuals walking between projector and screen were unaware that they were entertaining me with a butterfly fashion show. 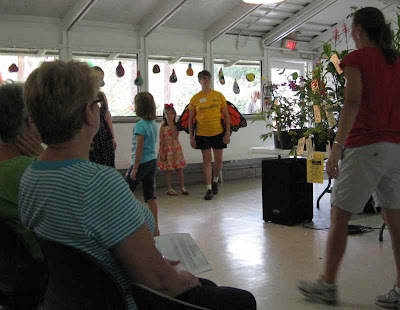 The authors warned their audience that butterflies don’t like “herds.” But the butterfly duo and Gardens Executive Director Bill Finch were willing to lead the herd, and about 40 members of the audience stayed for the stroll. 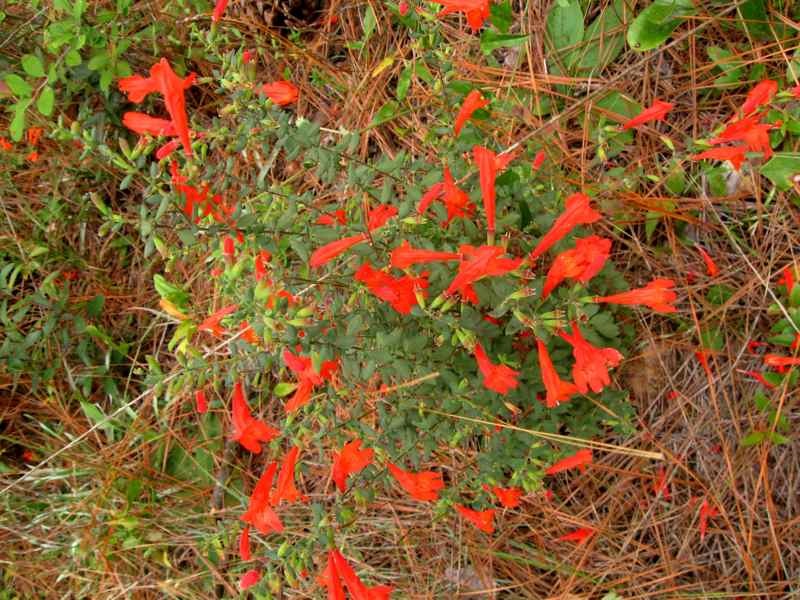 After a stop at a bed of lantana for a look at several species attracted to the golden blooms, our guides headed up a hill and into the coastal woodland that the Gardens is restoring to its primitive state through controlled burns of undergrowth. Sure enough, butterflies took flight and made themselves scarce, but it was immediately obvious that the trio’s knowledge about the wildflowers and their relationships to the butterflies would make the trek worthwhile. Even with my trusty hiking stick, I soon realized, however, that the low-growing vegetation, uneven surface and steady change in elevation would make slow-going for me. I paused to photograph the native red basil Finch had mentioned. 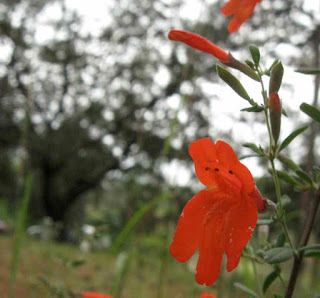 The plant’s proximity to the ground was a challenge, but one of the things I like about flowers is that, unlike butterflies, they don’t fly away. 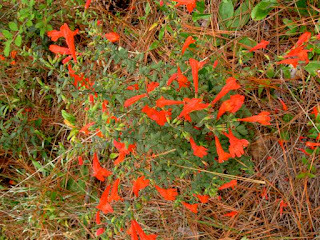 The plant boasted abundant blooms. A vine snagging my foot reinforced my realization that, at least on this occasion, I would not be able to keep up with the group or position myself to hear our guides. Hubby concurred and pointed toward dark clouds moving in from the west. We headed back to our van. As we drove just beyond the Gardens entrance, rain started. 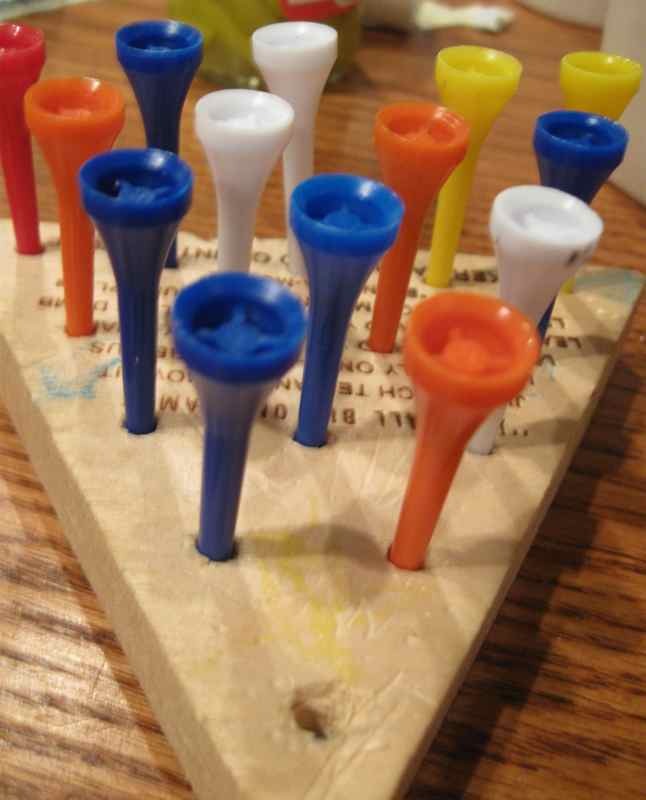 We stopped at a Cracker Barrel for lunch. 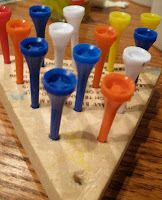 While we waited for our country cooking choices to arrive, I indulged in a few rounds of that peg game that is always on the restaurant’s tables. We drove home in a downpour, but the day was a success and the weather’s timing perfect for us. And I was well-pleased with my new book. Hubby posted here about our outing. We received a call today from my rehab center. I have been approved to restart occupational therapy sessions next week. I was discharged from both physical and occupational therapy in late June. I am excited to start back working with therapist Amy on regaining the function in my left shoulder, arm and hand. I love butterflies, or the father of my children called them, flutterbys. I loved your photo of butterfly fashion. How clever was that? I'm sorry you couldn't do an entire day, but I think what you did was amazing. Great news on the therapy! The photos are gorgeous! I give you credit for attempting the hike, but it was a good thing you got into the van before the rain started. Good luck with the therapy. I think a series of photographs "from where I sit" is a great idea. A different perspective. Good news from Rehab Linda. Your progress is wonderful and I am glad you could learn more about the butterflies. Good decision on leaving the tour when you did. Wish we had Cracker Barrel out here in California. I have many good memories from our various trips to the mid West and South. I could sit in those rocking chairs for hours and watch the world go by. Marcia, the"from where I sit" idea I borrowed from Sandra at the MadSnapper. She has lots of good photo ideas. To Sue at Photowannabe, Our rocking and watching was of a downpour. When the rain eased offd a bit, we made a dash for our van. Well as much of a dash as possible with Hubby holding onto me for my safety and an umbrella to keeps from getting soaked! Progess is still happening I see. A visit to a botanical garden does wonders for my soul. Thanks for sharing your trip and visit to the butterflies and basil. I love the programs botanical gardens give on home gardening. Even if it rained you did indeed have a successful trip.